In part one of the Turck Tarantula, master fly tier Skip Morris takes you through the origins and development of this popular attractor fly. In part two, he shows you how to tie it, with clear step-by-step instructions. The Turck Tarantula: Unusual...or Not? If this fly(often referred to as Turks Tarantula) strikes you as bizarre...well, you need to get out more. When you do get out, take a look at the Chernobyl Ant, the Royal Coachman Trude, even my own Predator—this fly looks pretty normal alongside other attractor dry flies. Bizarre or not, it works. I first tried it on a small river with a healthy population of cutthroat trout. The fish were wild, strong, of good size—some truly large—and moody. Their mood called for big attractor dry flies, it seemed, and they came freely to the Turck Tarantula. My wife Carol and I used the fly often during our week on that and other cutthroat streams in the area, usually with success. In my experience—and according to everything I've read about it—the Turck Tarantula is an attractor, pure and simple. I suppose an open-minded trout might take it for a big stonefly or even a grasshopper now and then, but the resemblance strikes me as pretty thin. but stir at the sight of some big silly wad of hair and rubber on a hook. I found this amazing fly in Jack Dennis's Tying Flies with Jack Dennis and Friends, but had heard of it before that, and what I heard was that it was a hot new attractor pattern. According to Jack's book, Jackson Hole fishing guide Guy Turck developed the fly based on what he liked about the Madam X and what he felt it lacked. He liked its gangly rubber-strand legs, but felt the fly lacked sufficient buoyancy. So he kept the legs; dubbed on a thick, fuzzy body, and added a head of flared buoyant deer hair. Apparently his creation was a hit—and a winner—at the Jackson Hole One Fly contest. In big fast water I just drift the fly and let the movement of the water wiggle the legs. At the end of the drift, if nothing happens, I swing the fly in the current, pull it under and pump and retrieve it back wet. I myself normally fish this big fly entirely on top, dead drift usually, but occasionally with twitches. Turck's approach, however, certainly covers more ground than mine—he makes it a free-drifting dry fly, briefly a skating one, and finally a sort of bucktail or minnow-imitation, all from one cast. 1. The body should be full—feel free to spin lots of dubbing onto your thread, and to wind the dubbing-covered thread up and down the shank two, even three times. 2. The dubbing itself is hare's mask, if you stick with the pattern, but I prefer tan or light-brown synthetic dubbing—Poly dubbing, Antron...—because synthetic fibers are more buoyant than fur. 3. If you mount the legs as I describe in the photos and captions, they'll tend to sweep back, especially if you create a tightly packed head. If you want the legs out more to the sides, bind them on about two thirds up the body, short of the wing-head area. Building the head is standard hair-flaring procedure—if you don't know how to flare deer hair, lots of tying books and videos out there can help. 1. I work a bunch of hair down around the shank; wrap two turns of heavy thread around the bunch; hold the bunch firmly in place as I tighten the thread; draw back all the hair-ends in front, and then pull the thread firmly forward and secure it in a few tight wraps. 2. I bind second, perhaps even a third, bunch in front of the first in this manner, pushing each bunch back into the last. 4. However you trim the head, make sure you hold the legs back out of the way—there is no way to replace the legs if you cut them off. Tying Flies calls for a heavy wire hook for this large fly, insurance, perhaps, against losing the big fish it can attract. But since it is a dry fly, I use a standard-wire or light-wire hook. 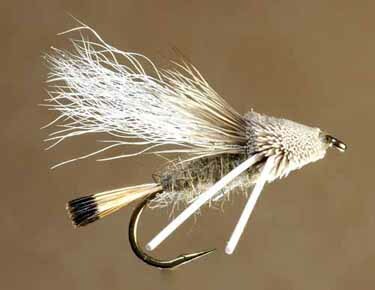 I don't believe such a hook has lost me any fish yet, and this particular fly has taken me a few dandies. I also generally use a 2X-long hook rather than the 3X long listed in Jack's book. For photos and instructions on tying this popular attractor dry fly, go to Turck Tarantula, Part 2, Tying Steps.